Ask yourself where you want to be in 5, 1O, 20 years’ time. Perhaps in a new home, kids settled into good schools, with your money working hard for retirement at 60. You may want to start a business or spend a year in Provence with the family. Be specific, put some dollar figures beside each goal and then start planning how you will get there. We can assist you in your goal setting and in mapping out a strategy to achieve your goals. As sayings go, ‘don’t put all your eggs in one basket’ is an oldie but a goodie. 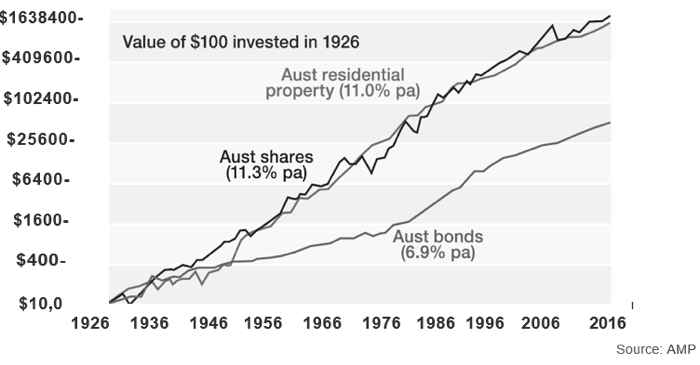 Shares, property, bonds and cash all have good years and bad; they also have different investment cycles. Even though shares and property provide the best growth in the long-term, prices can fall or move sideways for years at a time and you don’t want to be forced to sell in a downturn because you need the cash. As the chart below shows, investors who panicked during the 2007-08 financial crisis and switched out of shares into cash and bonds would have done better to sit tight and ride out the volatility. And investors who took the opportunity to top up their holdings when the market was gripped by pessimism would have done even better.